listen and learn, then exercise. read and learn, then exercise. 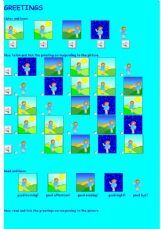 Very easy online exercises on greetings : good morning, good afternoon, good evening, good night and good bye. A very nice work for primary students. Thanks for sharing!!!! Only two comments?? Well done, Anne! Thank you for sharing!...I´m going to use it! Thank u so much! u saved my class!